Farewell to a Friend | Does This Font Make Me Look Fat? Last Wednesday some friends and I held a “celebration of life” gathering for our friend, Marylou, who died last winter. We had sent out information to the groups for which we knew she volunteered. The day was warm and it was not raining although holding the gathering in the backyard of the Woman’s Club would have been like gathering in a swamp. So inside it was and the legs of the folding chairs did not sink into the ground. The room was full with Marylou’s friends. 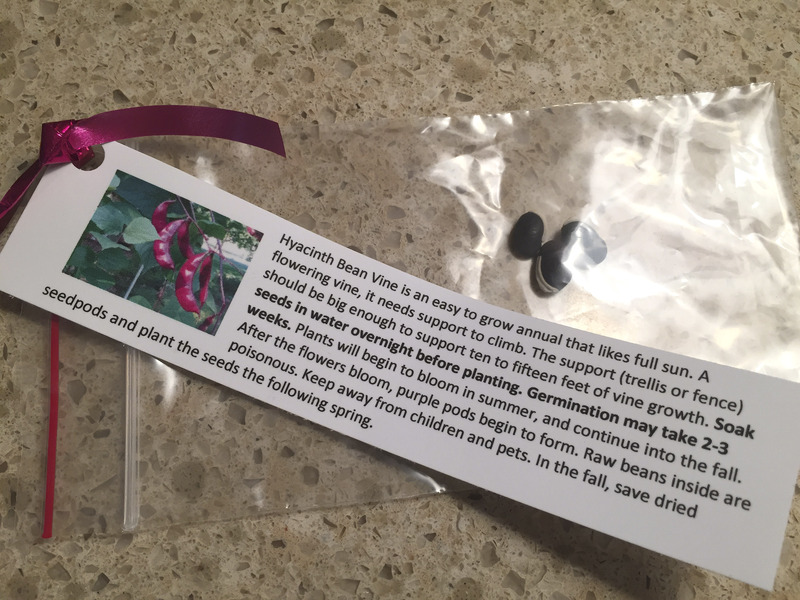 Every year my friend gave me hyacinth bean seedlings so we made little packages of beans for people to take as a remembrance. Friends and family shared memories of a life well lived. We would have liked to have her with us longer. We ended the celebration of Marylou’s life with the words that are said at the end of each yoga class. They seemed fitting. Sorry to read of the loss of your friend, and this is a beautiful tribute.